A delicious metafiction treat. Om nom nom! This book is really entertaining. I love me some good ol’ fashioned metafiction and this fits the bill nicely. Bella is walking her dog when something very odd happens. 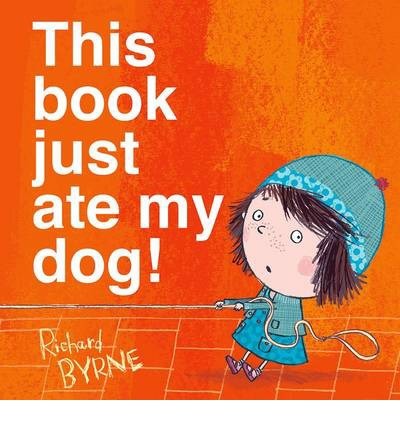 The book she is in eats her dog! In reality, we see that her dog has disappeared into the gutter of a double page spread (the gutter is the centre crease where the two pages meet). Well what’s a little girl to do?! Try and find help of course! But retrieving the dog isn’t going to be as easy as Bella hopes. I adore that this book embraces the shape and feel of a book and utilises these aspects to engage the reader. It’s not a complicated story, but it sure is a fun one. Funny thing though — this book is available on e-readers whereas other books that don’t involve the feel and shape of a physical book as part of the storyline are not. Isn’t that a little quirky? But everything about this book is. If you enjoy some silly interaction and an uncomplicated story, this one is worth your time. You can grab a copy for yourself at: http://www.goodreads.com/book/show/20518873-this-book-just-ate-my-dog. The book is written and illustrated by Richard Byrne and published by Henry Holt and Co. I’d recommend this one for kids 3-7. ← Meet the Dullards is anything but dull!